The Bermuda College team "Deep Divers Inc." runs their underwater robot through one of the three challenges in this year's Marine Advanced Technology Education (MATE) Bermuda Regional Remotely Operated Vehicle (ROV) Challenge. The team would go on to win an award for "Best Overall Product Interviews" in the Scout/Ranger category. 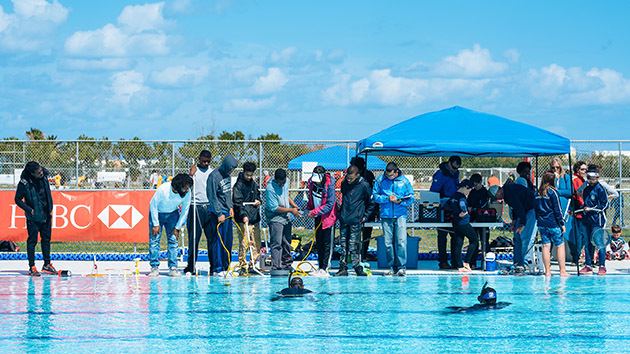 In Bermuda, students of all ages—primary school through college—have a unique opportunity to develop and demonstrate a range of skills, from math to group problem solving, by participating in the Marine Advanced Technology Education (MATE) Bermuda Regional Remotely Operated Vehicle (ROV) Challenge. The annual event, held this year in late March and hosted by BIOS with lead donor support from HSBC Bank Bermuda Limited (HSBC), is part of BIOS’s Mid-Atlantic Robotics IN Education (MARINE) program. Teams use special viewing lenses to help them see below the surface and navigate their robots as they attempt to complete various tasks based on real-world needs and challenges. 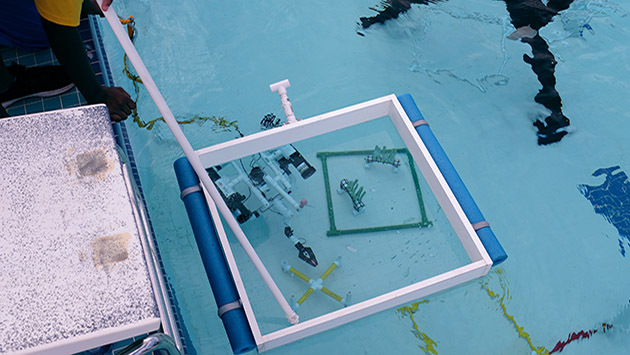 In this task, teams were asked to use their ROVs to "install" a monitoring package by placing the yellow "x" within the green square, and to pick up "seagrass" specimens (seen in green square) for restoration activities. “The ROV Challenge reflects BIOS’s commitment to using underwater vehicles to understand complex ocean processes,” said Kaitlin Noyes, director of BIOS’s Ocean Academy. Building ROVs fosters critical thinking skills, enhances individual and group problem solving skills, and boosts technological fluency, she said. It also supports education goals associated with science, technology, engineering, and mathematics, known as the STEM fields. Each year, MATE develops a new theme for the robotics competition based on potential real-world situations. This year’s theme, “Jet City: Aircraft, Earthquakes, and Energy,” challenged teams to develop ROVs capable of locating airplane wreckage, recovering wreckage debris, and installing a variety of underwater scientific equipment (all challenges were simulations placed in a pool at the National Sports Centre). In addition to the design, construction, and operation of an ROV, teams were also required to prepare technical reports and poster displays, as well as give engineering presentations and interviews to a panel of judges, many of who are working professionals in STEM fields. 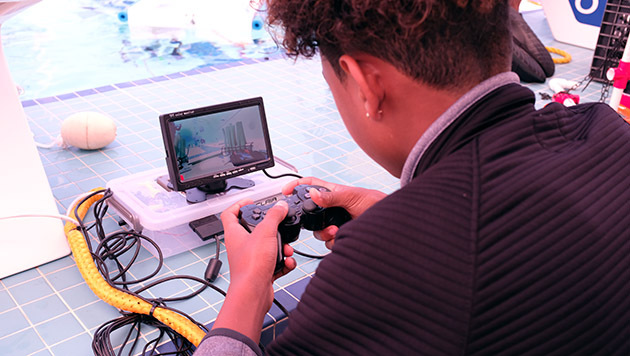 The pilot from Clearwater Middle School's team "KNZL Robotics" uses a display screen and a video game controller to maneuver the team's ROV underwater. The team would go on to win Second Place Overall in the Scout category. BIOS would like to extend special thanks to La Trattoria and the Orange Bay Company for sponsoring a pizza lunch for all participants, mentors, and event volunteers.